I read a blog post on @mikecj’s blog called The Blog Plateau, where he asks for ideas on what to do when your blog traffic reaches a plateau. I suggested that one thing to do is to widen your blog niche. The question then was asked, what does it mean to widen your blog niche? I want to use this post to explain how you can do that. So what are the reasons for a blog’s traffic to plateau out or even worse start to drop? Well there are many, some you have no control over, while others you do. Focus on the ones you have control over. Poor Quality Posts – A very strong cause. Re-evaluate the quality of your posts. Seasonal Posting – Check to see if your posts are not seasonal. In other words are they linked to specific news items or events that eventually grow old or go out of favour? Drop in Promotional Activity – Has your blog promotion plateaued or dropped. Look to increase exposure by a more active marketing strategy. Topical Interest – Are you writing too much about what you think is topical amongst your readers? Topics and interest change. Re-evaluate your target audience. Too Narrow Niche – Your niche is too narrow. Your target audience is limited. Your topical exposure is also limited. Broaden your niche. Lack of Engagement – Are you engaging your readers? Are you replying to their comments? Are you answering their questions? Think of your blog niche as a target. After all you have certainly head of a targeted audience. The bull or centre of the target is your blogs absolute chosen niche or topic. Each circle away from the target is a niche or topic related to the inner circle but yet slightly different. So that eventually the outer most circles are almost far removed from your niche. Then think of your traffic as a shot from a shotgun. The majority of the shotgun pellets will be concentrated on the bull. This represents your targeted audience. Then there will be a number of stray pellets that will be found in the surrounding circles. Getting less and less as the target circles widen and get larger. This represents readers to your blog that are interested in a topic that is somewhat related to your niche. Increase the circles of your target. That is, broadening your target. Do this by writing about a wider range of topics. Increase your shotgun bore so that you have a greater chance of hitting more of the target. Do this by attracting more readers to your blog. This is dependent on the point above. My blogs niche is quite broad as it is. But for argument's sake let’s assume that I concentrated on one niche. Web development. How to broaden your niche. There are many ways to increase traffic to your blog. But to answer the original question posed to me, I would like to concentrate on how to broaden your blog niche. You are not the only one to suffer from blog traffic plateauing out or stagnating. There are many other bloggers in the same boat as you. There are also many who were in the same boat but managed to over come this. Research your competitors. See what topics they are blogging about. What niche markets they are getting in to. Research your competitors niche markets. See if they can be applied to yours. Research the traffic flow of those markets. Research your competitors competition in the same way. Keyword research is a great way to glean what readers are searching for in a particular market. What kind of topics interest them that are related to a given market. There are many online free keyword research tools that you can use to great effect. For example I did some quick research for the terms “Web design” and “Web Development”. What caught my eye was an increase for mobile phones, smart phone, and development surrounding these devices. As well as an increase in the search for logo design. Mmmm interesting. In June 2009 Google released a new feature called the Wonder Wheel. Google Wonder Wheel is a new great feature from Google which allows you to see relevant search results to your query in a unique semantically relevant and graphical way. Google’s Wonder Wheel is a research refinement tool. This will help you to see related search terms and topics for your chosen keyword. 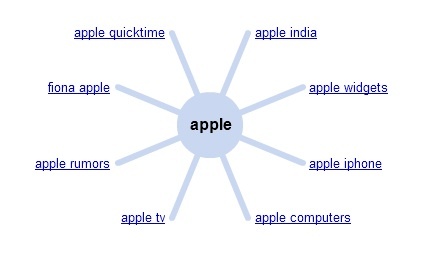 The Google wonder wheel has spokes for other search terms related to your original search. Clicking on a related search term bring up a new wheel with new spokes related to that search term. You can go on almost indefinitely with this branching out to topics and niche markets related to your blog. Access the Google Wonder Wheel by selecting options under the Google Logo, then Wonder Wheel in the menu that is shown on the left. Check out this great article explaining more on the wonder wheel, Google Wonder Wheel – Step by Step. Try to form partnerships and relationships with other bloggers. Within your niche, as well as outside your niche. Offer to write a guest post. Invite others to write guest posts. Promote each others blogs and posts. Run a free ad or banner campaign for them on your blog. Find new way wherein you can help each other. Comment on each others blogs. Help answer questions. When you attempt to broaden you niche do not forget or neglect your current readers. The key here is slowly slowly. Do it step by step. Have patience. Be careful that you do not stray too far off your original topic. I mean, if I am blogging about web development, I don see how dog training is an effective way of broadening my niche. It has got to be related in some way, a'la the Google Wonder Wheel. The last thing you want to do is alienate or irritate your current loyal readers. If you have any questions or comment, please feel free to ask. T = mc2 – The quintessential formula to blog traffic. How have you helped a fellow blogger this week?